Make every square foot of your allotted storage space count by knowing the different types of storage drawers and find the best one that will address your needs. With soaring real estate prices, every cubic space counts and that leaves only a limited amount of space we can devote to storage. Storage drawers come in handy for circumstances such as this. With the drawer’s three-dimensional and full-extension capabilities, you can utilize every available cubic space from front to back, side to side, or top to bottom. Storage drawers are also a fantastic way of storing small to medium-size items that are non-stackable and of irregular shapes and sizes. Drawer interiors also protect the stored items within them and conceal some cluttered items from sight. If you’re looking to take full advantage of your storage space, learn more about the different types of storage drawers below to find the most suitable one for your needs. Plastic storage drawers are among the most convenient storage options that you can purchase. These storage drawers are typically stackable and will be able to hold a lot of stuff. People sometimes use these drawers in the place of a typical dresser. They can fit clothing or they can be used to hold onto other miscellaneous things. These stackable storage drawers are really easy to use. You will be able to fit them just about anywhere that you need to. It isn’t uncommon to see people using these stackable drawers in their closets. Many people stack them up high and place them in a room similar to a normal dresser. Whatever it is that you want to do with these stacking drawers to help with your storage problem, it will likely be possible. You know that plastic stackable storage drawers are versatile, but you should also know that they are cost-effective. Drawers such as these are not going to cost you much money at all. You will be able to purchase them at a reasonable price and use them to solve your storage problems. When you don’t have a lot of money to spend, this is likely going to be your best bet. Of course, not everyone is a big fan of these stackable storage drawers. Some people find them to be a bit on the dull side and don’t like how they look in their homes. If you like bold and elegant furniture, then you aren’t likely going to be pleased about having these storage drawers prominently displayed somewhere. It depends on your sensibilities and what your needs are. Rolling storage drawers are another common solution that can really help you out. If you want to be able to store things as easily as possible, then drawers such as these are great. You will be able to put things inside of the drawer and then roll it wherever it needs to go. This allows you to easily access the items in the drawers and you can move it from place to place without it being a hassle. There are several types of rolling storage drawers on the market for you to choose from. The most affordable style is going to be similar to the plastic stackable storage drawers mentioned above. A rolling drawer that is done in this style isn’t necessarily going to be stackable, but everything else about it will be similar to the plastic drawers above. When you look at the specific rolling storage drawer being shown here, you will see that it has many compartments. You’ll be able to use all of the drawers to store a lot of stuff. These types of storage drawer solutions are actually very popularly used in the classroom as well. It is very easy to be able to roll it out of the closet when you need to access papers or certain types of equipment. This will make for a convenient storage option for anyone that needs to make good use of their space. Most of the rolling storage drawers that are made out of plastic will be very affordable too. You won’t have to pay out an exorbitant sum of money to get one of these. It will be a reliable storage solution for you and you can tuck it away in a closet when it isn’t in use if you want to. There are even some cabinets on the market that come with storage drawers. When you think about purchasing a cabinet, drawers aren’t the first thing that you think about. You may assume that the cabinet will come with shelving and traditional drawers. If you like the convenience of having a drawer along with your cabinet, then you can find one that includes at least a couple of drawers. Storage cabinets such as these can be useful for so many different reasons. You will be able to store anything that you like in these cabinets. It can help to keep your home from feeling too cluttered. The overall look of the cabinet should be nice too and you will be able to find one that fits in with your decorating style just right. This storage cabinet is really attractive overall. It features two storage drawers, as well as plenty of cabinet space. This is certainly a more expensive storage option than the ones mentioned above, but it looks a lot nicer. If you want to have a furniture item that will add to the aesthetic appeal of your home while providing you with increased storage options, then you will love this cabinet. It is very good looking and it will work well in many different types of rooms. Dressers are one of the most common types of furniture that has drawers. Many people use dressers to store various items. You can use dresser drawers effectively to help you store clothing, books, electronics, and much more. As long as you can place the items into the dresser drawer safely, it should be able to act as an effective storage spot for them. Storage dressers such as this one are very nice and you will commonly see them in people’s bedrooms. It has a nice black cherry wood finish that has an elegant appearance. You can also choose to purchase this dresser in either dark chocolate or black, so you do have some options. All three of the color schemes work very well, so you should be fine no matter which one you choose. You will have a good bit of storage with the six dresser drawers here. They are fairly deep and will be able to hold many items. Most people use dressers of this size to hold clothing, but it can work well for other purposes too. Simply take the time to determine if this is the right size to fit your needs before you purchase it. There are bigger dressers out there, but this one will work nicely for many people. Fabric storage drawers are becoming more common every year. These little storage drawers are easy to put in your closet and they can help you to stay organized. They can also be quite nice as accent pieces in your bedroom. The fabric storage drawers have the potential to look a bit more high end than the plastic ones. They aren’t quite as inexpensive as the plastic storage drawers, but they are fairly cost-effective overall. Buying fabric storage drawers is going to be less pricey than going out to buy a dresser. It sort of falls somewhere in between plastic storage drawers and a regular dresser. If you need a good solution to your storage problems, then this should wind up working out pretty well. Fabric storage drawers have become very popular in dorm rooms as well. These drawers look fashionable and also have a bit of a fun vibe to them. They are more commonly used among young people, but all ages can appreciate them. They’re great for people who want storage drawers, but don’t want to pay a high price for a nice dresser. The storage drawers being shown here are really interesting from a visual perspective. There are multiple different fabric colors that help to make this set of drawers stand out. There are six large drawers and two small drawers at the top for you to make use of. This should be among the most cost-effective storage options for you to consider when you care about how it will look in your room. Buying storage furniture that you can work into your bedroom is very helpful. If you live in a small environment, then you may want to try to make the most efficient use of your floor space. People who live in apartments and condos often have to really think about the size of the furniture that they are using. You might not have room to place a traditional dresser in your bedroom if it is very small. The solution to this is to buy furniture that has hidden drawers included. The bed being shown here has several drawers built into the frame. This is an excellent place to store your clothing and you will be able to fit a lot of your daily essentials too. For people living in smaller bedrooms, this is going to be very helpful. The bed frame itself actually looks pretty trendy, too. You will be able to enjoy having a nice bed that happens to have some convenient storage solutions for you to use. The frame comes in two different sizes for your convenience as well. You can purchase a queen or a king and either of them will have drawers that are a good size. There are even some benches on the market that have storage drawers built into them. Sometimes, people like to place benches such as this outside on their patio. It can wind up being a great spot to store some of the outdoor items that you want to keep out of the elements. 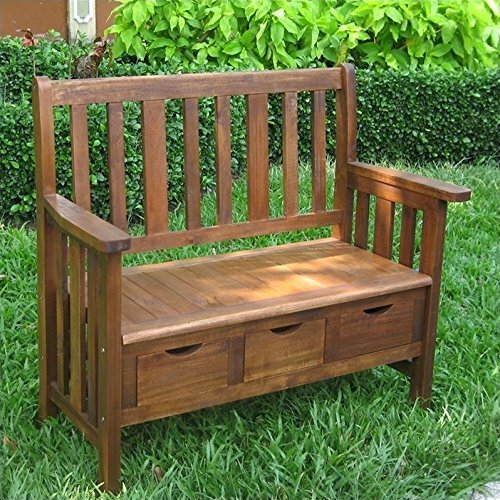 This bench will look right at home in your yard and it will give you several drawers to use. The bench itself is made out of a very solid acacia hardwood. It will be durable enough to be used outdoors without having to worry about it. A bench such as this can provide a comfortable seating option in your garden area and it can also fit right into your patio area without feeling out of place. You’ll be able to use this bench indoors, too, if you really want to. Benches, such as this, that are rated for outdoor use need to be made to withstand the elements and the harshness of the sun. This bench is waterproof so that rain won’t be able to cause it any harm. It is also made to be resistant to the sun. The UV protection of this bench is quite exceptional, meaning that it won’t fade in the sun and start to look shabby. There are actually a lot of these benches on the market that you will be able to peruse. If you want to find a bench that looks more at home indoors, then you will be able to find one. Getting one with drawers will certainly be useful and you can make use of the extra room right away. Being able to store things in your bench seat is definitely very appealing. Filing cabinets may not be something that you think of immediately when talking about storage drawers, but they really are pretty much the same. The difference with a filing cabinet is that people generally use them to store important files and papers. If you have tax records, medical information, and other important documents that need to be stored somewhere safe, then it makes sense to own a filing cabinet. There are many different styles of filing cabinets on the market to choose from, but just about any of them should work well for your needs. This filing cabinet here is a very simple and standard type of storage option. A vertical filing cabinet such as this will work perfectly to store your important files and documents. Whether you have a few things to tuck away or if you need to store a veritable ton of documents, this should work out well. It is generally going to provide enough filing space for an individual or a small family, so it should be perfect. If you are looking for something with a look that will fit in with a modern décor, then you will be pleased by this. It has a standard black metallic appearance that will work in most homes. It will look right at home in a home office setting and will also look fine in your bedroom. This is a filing cabinet that you should consider if your storage needs extend to important files. Keep in mind that there are many filing cabinet options on the market. If this three drawer unit will not suffice, then you will be able to find something much larger. Filing cabinets can get really tall and they will work well to store your documents safely. Think about your needs and how many files you need to store before you make your purchase. You will also be able to find an Ottoman that has storage built right into it. Sometimes, these Ottomans will be hollow on the inside, allowing you to remove the cushion to store various items. This is different from those types of storage Ottomans, as this actually does have drawers. The Ottoman being shown here actually somewhat resembles a small coffee table. The drawers of this Ottoman can be pulled out so that you can store things in there. This is going to be really convenient for people that need to store books or other materials to use in their living room. It helps you to keep your living room from looking so cluttered, as you will have a convenient space to tuck away odds and ends. Making use of this Ottoman should be very easy and it can still function well as a footstool or an extra seat. The Ottoman being shown here is quite stylish, too. It looks like a very elegant piece of furniture that would fit in with just about any style. If you are looking to add some storage options to your home without having to add in a dresser, then this option will appeal to you. It gives you a handy storage drawer while not taking up much of your floor space. Storage Ottomans are a cost-effective way to add a little bit of storage to your living room. People love Ottomans because they can function both as seats and as a place to stretch out your legs. These will definitely be useful to own, so consider it if you are in need of an Ottoman. It will definitely look good in your home and you will like the extra storage. It won’t be too difficult to find a proper coffee table that has storage drawers, too. People who like to drink coffee will often have coffee tables in their living rooms. They are the perfect spot to set your drink down when you’re enjoying a coffee in the morning. These tables also provide a nice place for you to set decorations and many people place magazines on them. You can add to the utility of a coffee table even more if you choose to buy one that has drawers. This will allow you to store various things inside of the drawers. Some people use these types of drawers to put away various household items. It can even be a good place to keep essentials such as pens, paper, and charging cables. The coffee table that is being used as an example is actually very nice. You will be able to enjoy adding a coffee table such as this to your home. It has a really nice look to it while also still being affordable enough to be practical. It will give you just a bit of extra storage with the drawers and it will definitely come in handy. Some people may find that the storage offered by these drawers is inadequate. This certainly isn’t going to be enough storage to suit all of your needs, but it can be a part of your solution. Adding bits of storage here and there can actually be an effective method. You need places that you can store your miscellaneous stuff, and a coffee table with drawers seems like as good of a place as any.